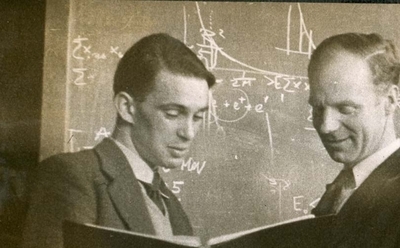 In Vienna, his home city, Bruno Touschek worked with Rolf Widerøe, a Norwegian particle physicist on the development of the Betatron, the first circular accelerator for electrons, an idea Widerøe propounded in 1922. Touschek advanced the theoretical analysis of the stability of particle orbits and they discussed together the possibility of colliding stored electrons and positrons head-on. Touschek regarded this is an obvious idea impossible to patent but Widerøe obtained a secret patent in 1943, retrospectively recognised in 1953. "He was the initiator, but also the element of continuity during the ten golden years of the Laboratories (of Frascati) , the person that had a great idea and allowed it to be materialized by others; his scientific and human qualities, I believe, were decisive in maintaining the connections which have been essential in achieving success"
In February 1947, Touschek arrived in Glasgow University as a Department of Scientific and Industrial Research fellow where he worked on the development of the first electron synchrotron in Europe, a 350 MeV project then being initiated by Professor Philip Dee. He published an analysis of the synchrotron properties in 1949 as well as his PhD thesis on correlations between electrons and nuclei. He was then promoted to lecturer and worked on a range of theoretical, experimental and accelerator questions. By the time, he moved to Rome in December 1952 to help start accelerator technology in accelerator physics, he was arguably the world leader on all aspects of circular electron accelerators. At a seminar in Frascati on 7 March 1960, he proposed the he idea of a collider: a particle accelerator where a particle and its antiparticle circulate the same orbit in opposite direction. This concept is at the base of all present-day very high energy particle accelerators, such as the Large Hadron Collider. His prototype device the AdA (annello di accumulazione) ran successfully on 27 February 1961. His invention revolutionised the field of particle physics. Born 3 February 1921, Vienna, Austria. 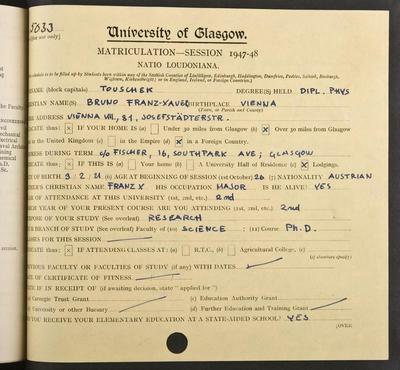 Bruno Touschek (1921-1978) was a Glasgow graduate and lecturer in Natural Philosophy from 1949 to 1952 who invented the storage ring for high-energy elementary particles. Born in Vienna in 1921 his early academic career was blighted by anti-Semitism and he was forced to leave the University of Vienna in 1940 because his mother was Jewish. 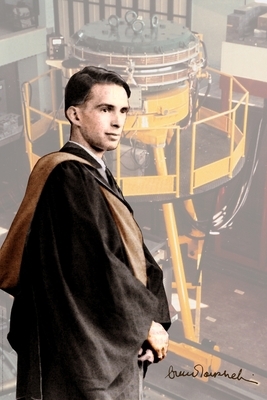 He was able to continue his studies at Hamburg, where he was unknown, and there he worked with Rolf Wideroe on the development of the Betatron, the first circular accelerator for electrons. They were already discussing the possibility of colliding stored electrons and positrons head-on. His work was disrupted by his arrest by the Gestapo in 1945 and subsequent forced march to Kiel. 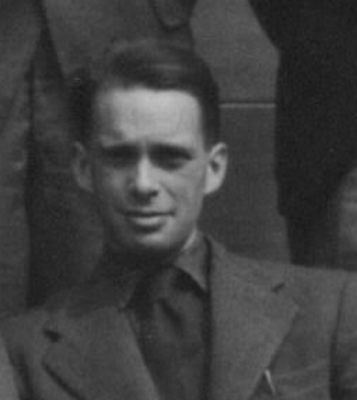 He survived and graduated from Gottingen in 1946. 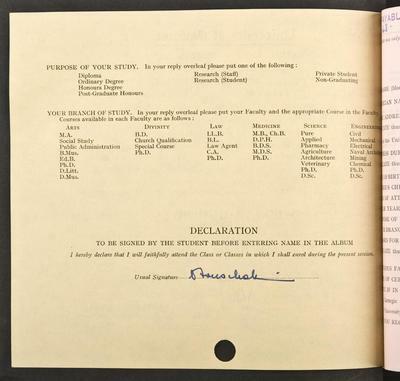 Touschek became a DSIR fellow at the University in 1947 and began research for a PhD which was published in 1949. He then became a lecturer in Natural Philosophy and he continued to develop his work on accelerators. He left the University in 1952 and became a researcher at the National laboratories of the Istituto Nazionale di Fisica Nucleare in Frascati and a lecturer at the University of Rome-La Sapienza. He died in 1978. Amaldi , E. 1981. The Bruno Touschek Legacy. CERN report. 81-19. Bonolis, Luisa. 2005. Rivista del nuovo cimento. 28:11:1. Touschek, B. 1949. Das synchrotron. Acta Physica Austriaca. 3: 146. Waloschek, P. 1994. The infancy of particle accelerators. DESY Report 94-039. The idea of a collider: a particle accelerator where a particle and its antiparticle circulate the same orbit in opposite direction is the basic proposal of all present-day very high energy particle accelerators, such as the Large Hadron Collider. The prototype device ran successfully within the year. World Changing Project, "Inventing the storage ring for high-energy elementary particles," in University of Glasgow World Changing (University of Glasgow, 2010); http://www.worldchanging.glasgow.ac.uk/article/?id=61 (accessed April 22, 2019). World Changing Project. "Inventing the storage ring for high-energy elementary particles." In University of Glasgow World Changing. University of Glasgow, 2010. http://www.worldchanging.glasgow.ac.uk/article/?id=61 (accessed April 22, 2019). World Changing Project. "Inventing the storage ring for high-energy elementary particles." University of Glasgow World Changing. University of Glasgow, 2010. 22 April 2019 <http://www.worldchanging.glasgow.ac.uk/article/?id=61>.